This Howard Johnson Hotel and Suites, Victoria Elk Lake is one of the newer Hotels in Victoria and that along with our quality guest service standards, makes us truly unique. 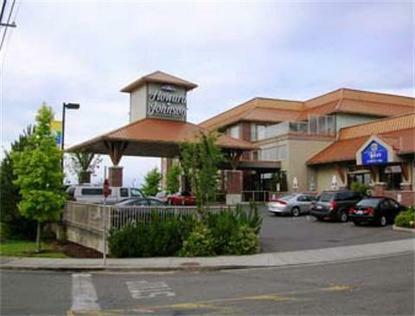 The quiet and convenient suburban location is half way between the BC Ferries/Victoria Airport and the Victoria Downtown core.All rooms include High Speed Internet Access, In-room Coffee, Desk with task lighting, Voice-mail, Hair-dryer, Iron and Board, individual Air Conditioning and heat controls. All rooms have Microwaves, Wet-bar and Mini-fridge. Additional benefits for the family or long term guests: some units have full kitchen facilities (with dining table and chairs). Add to all this an Outdoor Heated Pool (May to Sept), Indoor Hot Tub, and on site Mini-gym, for a totally comfortable stay. We boast one of the most popular restaurants in the area, the "Lakes Grillhouse and Bar" - offering a menu to suit all tastes.Pets are allowed. Continental Breakfast is available but not included in room rate.